Camp Ashraf or Ashraf City was a refugee campin Iraq's Diyala province, having the character of a small city with all basic infrastructure, and headquarter of the exiled People's Mujahedin of Iran (PMOI/MEK). The population used to be around 3,400 in 2012 but nearly all have been more or less forcibly relocated under pressure by the premier minister Nouri al-Maliki's office of the Government of Iraq to Camp Liberty near BIAP (Baghdad International Airport). Camp Ashraf (aka US Forward Operating Base Grizzly) is situated 27.6 km northeast of the Iraq the town of Khalis, about 80 kilometers west of the Iran border and 40 kilometers north of Baghdad. On January 1, 2009, the US Government formally transferred control over to the Iraqi government. Over the past 10 years, Camp Ashraf has been attacked several times, the worst being on April 8, 2011 when Iraqi security forces stormed the camp and killed as many as 36 and wounding 320 residents, and on September 1, 2013, leaving a death toll of 52 victims. The city of Ashraf was named in commemoration of Ashraf Rajavi, a famous political prisoner at the time of the Shah, senior member of the PMOI and wife of Massoud Rajavi. She was murdered in 1982 by the Iranian Revolutionary Guard Corps after the Iranian Revolution. The PMOI established base at Ashraf in 1986. The refugees began on a barred land with no facilities, paved road or running water. The members of PMOI built it into a modern city with a complex of roads and buildings with many educational, social, medical and sports facilities, manufacturing and agricultural works, and even having a university. According to the U.S. State Department, the MEK was then welcomed into Iraq, where it supported Saddam Hussein's war against Iran (1980–88). Even after the cease-fire with Iran, the Iranian Air Force carried out several air raids against Ashraf. The first of such raids was conducted using eight F-4 Phantoms armed with rockets and cluster bombs on 6 April 1992. During this raid one F-4 was shot down by either insurgent or Iraqi military anti-aircraft artillery and both pilots (Lt. Col Amini and Cpt. Sharifi) were captured and not freed until 1998. Despite threats of response, Iraq wasn't able to retaliate due to its own fight against Kurdish separatist guerillas and the Western-imposed no-fly zones that crippled and limited its air force's operations. Another air raid was conducted on 26 May 1993 against Ashraf and Jalat (near Sulaimaniya) with 12 planes, according to a PMOI statement. The attacks were in retaliation for several attacks on Iranian military personnel and oil pipelines in Khuzestan Province, which Iran described as attempts to disrupt the 11 June presidential election. During the 2003 invasion of Iraq, coalition forces launched air attacks against MEK forces. Mujaheddin commanders negotiated a ceasefire on April 22, 2003 in which they were initially allowed to keep their military equipment. In June 2003, US forces took control of Camp Ashraf and the MEK was consolidated, all their weapons were secured by special forces and their munitions and caches were maintained in a bunker complex located northeast of the city of Ashraf. Within months, the US sent in US military police battalions, to secure the bunkers and residents. Within a year, as a result of defecting Ashraf residents, two TIFs (Temporary Internment Facilities) were added increasing the military battalions mission and troop to task requirements. The primary TIF housed approximately 500 PMOI defectors who were under US control and frequently screened for additional intel by various government agencies. Along with the defectors, the compound was home to approximately 22 military police officers and a team of 6 communication specialists from a different unit to establish secure and encrypted modes of communication. The remainder of the military police and other supporting personnel were on the main compound 2 km away. A lack of infrastructure on the compound made housing so many defectors difficult. There were hostilities between those who defected and the remaining PMOI members who totalled approximately 5,000 and lived a few kilometers away. Threats of attacks by the remaining members constantly put US Servicemembers on alert as they were outnumbered almost 20-1 in 2004. Within the boundaries of the camp is Forward Operating Base Grizzly (formerly FOB Spartan, FOB Red Lion, FOB Barbarian). The Forward operating base is where up to 2,000 US and Coalition forces, used to reside. Under pressures from Tehran, food and fuel rations of Ashraf were terminated; elements affiliated with the regime blew up the water pipelines to Ashraf; and members of the MEK were abducted in Iraq. It is also known that a bus carrying Iraqi laborers to the city of Ashraf was blown up, killing 11. As of Summer of 2010, US Forces no longer maintained a presence at FOB Grizzly after handing over the facility to the Government of Iraq, effectively ending direct US monitoring of Camp Ashraf. Instead, Iraqi police has been stationed inside the camp, and the Iraqi army maintains its presence in the bunker complex outside the camp. On January 1, 2009 the U.S. officially transferred control of Camp Ashraf to the Iraqi government. According to a press release from U.S. Embassy in Baghdad, the U.S. would maintain a military presence at the camp and the Iraqi government would ensure that all residents were treated according to Iraqi law. A State Department spokesman said the Government of Iraq had promised both humane treatment of people at Camp Ashraf and that none would be relocated to a country where they would have "a well-founded fear of persecution". In late July 2009 conflict erupted when Iraqi forces attempted to enter the camp to establish a police station without the consent of the MEK. Accounts of the conflict differed. Iraqi forces used violence, including gunfire, water cannons and batons, killing eleven people and injuring about 400; two others were killed later on due to injuries. Videos taken by Ashraf residents show these scenes. Iraqi authorities denied using violent methods, but said unarmed residents used stones, knives and sharp tools to protect themselves and to fight security forces that tried to enter the camp. Journalists were excluded from the area. Video has surfaced purportedly showing Iraqi forces trying to repeatedly run down residents with vehicles. Amnesty International in its Iraq Report 2010 regarding human rights situation in Iraq wrote, "Following months of rising tension, Iraqi security forces forcibly entered and took control of Camp Ashraf (..) on 28 and 29 July. The camp, which houses some 3400 members or supporters of the People’s Mojahedeen Organization of Iran (PMOI), an Iranian opposition group had been under US military control since 2003 (..). Video footage showed Iraqi security forces deliberately driving military vehicles into crowds of protesting camp residents. The security forces also used live ammunition, apparently killing at least nine camp residents, and detained 36 others who they tortured". The Working Group on Arbitrary Detention of the UN Human Rights Council has intervened, in his Opinion of May 2010 to the Iraqi government, considering that the prisoners were held in Arbitrary detention. In its report of 27 April 2010, various aspects of violation of human rights in Iraq entitled as “Iraq, Civilians under Fire”, Amnesty International revealed and condemned violation of Ashraf residents’ rights by Iraqi government on July 28 and 29, 2009. In September 2009, in accordance with their mandate, the United Nations Assistance Mission for Iraq (UNAMI), led by Ad Melkert, Special Representative of the UN Secretary-General, started attempts for mediation between the residents and premier minister Al-Maliki's office; additionally, as reported by UNAMI issue leader Tahar Boumedra, Chief of the Human Rights Office, it ensured regular visits to the camp for monitoring human rights and as a deterrent against violence. In October 2009, in the frame of UNAMI's mediation, the Government of Iraq announced their will to close Camp Ashraf, while the residents responded that neither remaining in Iraq nor returning to Iran were safe options for them; they said to be prepared to move to safe third countries as soon as this become possible and asked for the necessary time for exploring this perspective. On December 10, 2009 the Iraqi government announced plans to move the MEK from Camp Ashraf to a former detention center, Neqrat al-Salman, about 200 miles (120 kilometers) west of Basra. In response, the MEK refused to comply with the decision. On December 15, 2009, Iraqi government sent a group of its security forces into the camp to urge the residents of the camp to leave the camp. They used loudspeakers and distributed pamphlets calling the residents to join them and leave Ashraf. However, no resident accepted to leave there. Media reporters were present on the scene. The UN issued a statement "exiled camp residents must not be deported". UNAMI, led by the UN envoy Ad Melkert disputed Nouri al-Maliki's claim, saying that UN would not embrace the government's efforts to deport Ashraf residents by the end of 2011; instead, as brought forward by the UNAMI issue leader Tahar Boumedra, all parties should be engaged: the Iraqi government for building civilian camp management capacities in line with international humanitarian standards, the PMOI for achieving a more realistic understanding of their reality, and the international diplomatic community. The failure to relocate the camp residents prompted the "Ashrafi Committee", an ad-hoc group of Premier Minister al-Maliki's office, to tighten the embargo on Camp Ashraf; from January 2010 on, despite the attempts of UNAMI for the protection of human rights, fuel deliveries, water and food supply were severely reduced, resident's vehicles were seized, and, finally, medical assistance and resident's access to hospital treatment and surgery were denied. In Spring 2010, the Iraqi Premier Minister's Office in cooperation with the Iranian embassy in Iraq arranged so-called "family visits" of some Iranian government-operated NGO's to destabilize Camp Ashraf. Assisted by the Iraqi army, they set up camp at the gate and fixed loudspeakers around the camp; over two years, there were around 300 units "blaring threats and insults day and night at the residents". On 17 October 2010, on the eve of al-Maliki's visit to Tehran, an armed attack by Iraqi forces took place, injuring 10 residents. On January 7, 2011, assailants bussed from Basra, Amara, Nasiriya and Baghdad to the gates of the Camp, in an action jointly coordinated by the "Ashraf Committee" of al-Maliki's office with the Iranian embassy in Baghdad, and backed up by Iraqi security forces, attacked the camp resulting in 176 wounded. Iraqi forces prevented the wounded, 93 of whom were women, to go to the hospital for treatment. On April 8, 2011, Iraqi security forces in bulldozers and Humvees stormed Camp Ashraf in an action enthusiastically hailed by the Iranian government. The Iraqi government, however, stated it believed that the event was a "riot". According to Amnesty International, video clips of the April 8 clashes  "appear to show Iraqi soldiers indiscriminately firing into the crowds and using vehicles to try and run others down". As a conclusion, it was confirmed by a UN human rights official, 34 residents were killed and 318 wounded by Iraqi forces. During Summer 2011, the Iranian authorities took new suppressive measures for espionage against Ashraf residents by installing two tall communication poles south of Camp Ashraf, preparing the grounds for next attacks. The Iraqi government said that the PMOI must leave the country by the end of 2011. The Central Investigation Court No 4 of the Spanish National Court, in face of impossibility of any investigation into the massacres in Ashraf inside Iraq by a government that itself has ordered these massacres, has taken on this case. In its last writ dated July 11, 2011, the court summoned senior Iraqi officers to appear before the court on October 3, 2011 for war crimes. The Iraqi prime minister Nouri al-Maliki is also to appear before the court once he leaves his post as premier that gives him immunity from judicial prosecution. End of April 2011 on a tour to Iraq, the Iraq delegation of the European Parliament, led by the British Conservative Struan Stevenson, was refused by the Government of Iraq to visit Camp Ashraf; it nevertheless issued a statement that it was in favour of a resettlement of the residents to safe third countries. This initiative was openly rejected by the Government of Iraq, and did not find support from the UN and the US. As a consequence of the April 8, 2011 attacks, UNAMI tried, between May and September 2011, to find a humanitarian solution via official bilateral meetings with Camp Ashraf resident's speakers respectively with the Government of Iraq. In the course of this process, the residents acknowledged that to become asylum seekers and the involvement of the UN High Commissioner for Refugees (UNHCR) was an option for them, with the ultimate target of a safe relocation to third countries; they expressed however high concern over plans for a relocation into a transitional facility inside Iraq, as they would become even more vulnerable to armed attacks than in their current city-like settlement. Under the guidance of Ad Melkert, UNAMI started to engage UNHCR into a process of refugee status determination of the residents. By end of September 2011, UNHCR had received more than 3000 applications for asylum by Camp Ashraf inhabitants. On Sept. 29, 2011, UNAMI and UNHCR requested the Government of Iraq to recognize UNHCR becoming engaged into the refugee registration procedure; however, al-Maliki's office rejected this proposal, pointing out that Camp Ashraf as a fortress of Iranian resistance should come to an end. On Sept. 28, 2011 the EU foreign policy Chief Catherine Ashton appointed Ambassador De Ruyt, as an advisor to mull over the fate of thousands of outlawed Ashraf residents facing expulsion from the camp in Iraq, their home for 30 years. In the mean time, Maryam Rajavi, called for the new nominee to visit Ashraf and to demand Iraq drop its bid to close the camp by the end of 2011. In August 2011, Ad Melkert was replaced by Martin Kobler as UNAMI Special Representative of the UN Secretary-General. Following a unilateral interpretation made by Premier Minister al-Maliki at the farewell meeting of 28 August 2011, Ad Melkert reiterated that the UN "continues to advocate that Camp Ashraf residents be protected from forcible deportation, expulsion or repatriation contrary to the non-refoulement principle". However, within few weeks after his arrival on 8 October 2011, Martin Kobler internally announced a change of strategy to the UNAMI staff, presuming that residents of Camp Ashraf were "terrorists" and that the Government could not be expected to negotiate with "terrorists", thus UNAMI's new goal would be a Memorandum of Understanding (MOU) with the Government of Iraq aimed to induce relocation. Bowing to Government's ultimatum to expel the residents by end of the year, this agreement was signed end of December 2011. In the course of the process, the Government had rejected any attempt to find a solution acceptable to all parties concerned, under inclusion of the residents, and which preserved their acquired rights, resulting in a mere displacement, without consent and participation by the residents, to the new temporary transit location Camp Liberty (Camp Hurriya in Arabic) in Baghdad (a onetime U.S. Marine base), where UNHCR would start to determine the resident's eligibility for refugee status. In 2012, as laid down in the MOU, near all of the resident were moved from Camp Ashraf to Camp Liberty, an operation which was presented by UNAMI and Martin Kobler as preventive diplomacy taking into account the main concerns of both actors and as voluntary relocation of people designated by the US as terrorist organization, leading to a safe path to a life outside of Iraq. A rocket and mortar attack leaving at least five dead and 40 wounded occurred at Camp Liberty on February 9, 2013. Iranian residents of Camp Liberty and their representatives and lawyers appealed to the UN Secretary-General and U.S. officials to let them return to Ashraf, which they say has concrete buildings and shelters that offer more protection. On Sept. 1, 2013, 52 members of MKO were killed at Camp Ashraf, in what the group claimed was a massacre by Iraqi forces. In a statement, U.N. Secretary General Ban Ki-moon deplored "the tragic events at Camp Ashraf" and said Baghdad should "promptly investigate the incident and disclose the findings." Ali al-Moussawi, a spokesman for Iraqi Prime Minister Nouri al-Maliki, later confirmed that several MKO members had been killed, but denied any involvement of the Iraqi authorities and stated the deaths were caused by infighting among the camp's residents. Officials stated that after the incident, MKO members attacked the local army brigade stationed in the camp and killed 4 Iraqi soldiers. In September and October 2013 letters and messages to President Obama, Senators John McCain, Carl Levin, and others, called for US pressure on President al-Maliki to "hold Iraq accountable for the massacre at Camp Ashraf and to save seven abducted residents". On September 11, 2013, Amnesty International launched an urgent action to the Iraqi Government calling for the protection and relief of the seven abducted hostages. ^ a b c d Kamn, Nicholas; Mazin Ezzat (2008-01-05). "Iranian Resistance Group a Source of Contention in Iraq". Time Magazine. Retrieved 2008-01-05. ^ Courson, Paul (2011-12-12). "White House talks on Iraq's Camp Ashraf draw protesters". CNN (Turner Broadcasting System, Inc.). Retrieved 2011-12-14. ^ "Camp Ashraf & Liberty". Retrieved 21 December 2013. ^ "Ashraf Rajavi and Moussa Khiabani". PMOI. ^ "Camp Ashraf & Liberty". NCRI. ^ Jonathan Masters. "Mujahadeen-e-Khalq (MEK)". CFR. ^ Ian Kelly, State Department Spokesman (2009-07-29). "Special Briefing". US State Department. Retrieved 2009-07-30. ^ a b c Mohammed Tawfeeq (2009-07-29). "Fights with police at Iranian refugee camp leave 7 dead". CNN. Retrieved 2009-07-30. ^ "Iraqi Forces Reportedly Open Fire, Beat Iranian Exiles". Fox News. 2009-07-29. Retrieved 2009-07-29. ^ "Video shows Iraqi Humvees running down Iranians at Camp Ashraf". Fox News. 2009-08-24. Retrieved 2009-08-30. ^ "IRAQ: CIVILIANS UNDER FIRE". Amnesty International. Retrieved 20 July 2012. ^ Murphy, Brian (2009-12-11). "Iraq seeks to shift Iranian group to desert camp". Google News. Associated Press. Retrieved 2009-12-16. ^ "MEK refuses to comply with Iraqi order to leave". Press TV (Tehran: Press TV). 2009-12-15. Retrieved 2009-12-16. ^ Hammoudi, Laith (2009-12-15). "Iranian dissident group defies order to leave Iraq". Miami Herald (Miami: Miami Herald Media Co.). Retrieved 2009-12-16. ^ "Iraq: Investigate deadly violence at Camp Ashraf". 5 April 2011. Retrieved 21 December 2013. ^ Kate Allen (14 April 2011). "Camp Ashraf is a barometer of Iraq's human rights". The Guardian (London). Retrieved 8 May 2011. ^ "Security situation in Iraq remains "extremely sensitive" http://www.europarl.europa.eu/news/en/news-room/content/20110429STO18375/html/Security-situation-in-Iraq-remains-extremely-sensitive-Struan-Stevenson. ^ UN Department of Public Information, Secretary General Appoints Martin Kobler of Germany as Special Representative for Iraq. ^ "BBC Middle East". BBC News. 1 September 2013. Retrieved 21 December 2013. ^ Tjonn, Halvor (13 September 2013). "Iranian dissidents were killed in the shelter of Syrian gas cloud". Retrieved 21 December 2013. ^ Tahar Boumedra (2013), The United Nations and Human Rights in Iraq. The Untold Story of Camp Ashraf, ISBN 978-1-909740-64-8, p.8. ^ "Written answers and statements, 25 November 2009". UK Citizens Online Democracy. 2009-11-25. Retrieved 2009-12-16. Camp Ashraf is in a sovereign and democratic Iraq and the camp residents subject to its laws. The UK is of the view that the residents of Camp Ashraf, as with all people in Iraq, enjoy rights and protections under the Iraqi constitution and applicable international obligations to which Iraq is a signatory. We do not consider that they have 'protected persons' status. We do not feel a ministerial statement is necessary at this time. ^ "Catherine Ashton appoints Jean De Ruyt to advise on the EU's response to Camp Ashraf" (Press release). European Union. 2011-09-27. Retrieved 2011-12-16. Jay Solomon (2006-05-22). "Iranian Exile Group Aims to Build Bridges". Wall Street Journal. Retrieved 2007-04-28. 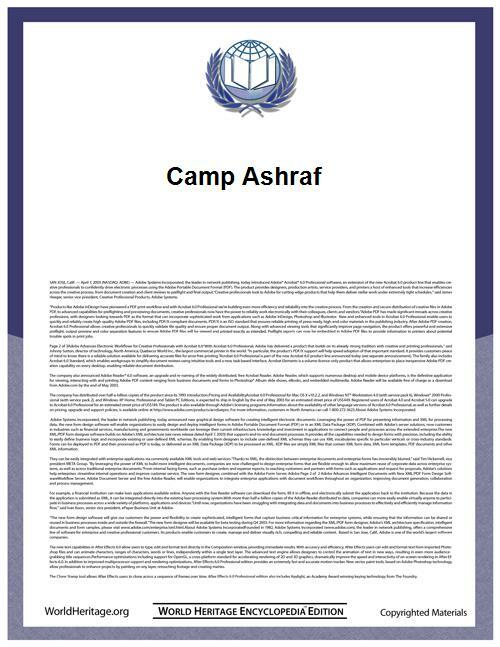 "Camp Ashraf". GlobalSecurity.org. Retrieved 2007-04-28. Scott Peterson (2003-12-31). "Inside a group caught between three powers". 1st Lt. Lea Ann Fracasso (2006-12-06). "Bulgarian Minister of Defense visits FOB". Brian Binley, a Member of Parliament from the United Kingdom’s Conservative Party, in a big gathering asked for protection of Ashraf. In his quarterly report to the Security Council of 14 May 2010 pursuant to resolution 1883, UN Secretary General Ban Ki-moon stressed the rights of residents of Camp Ashraf, Iraq, to protection against arbitrary displacement in Iraq or forced extradition to Iran. In order to better the humanitarian situation in the camp, EUHR Catherine Ashton appointed Jean De Ruyt, a senior Belgian diplomat, to advise on the EU's response to Camp Ashraf.